Business card design is probably the most challenging design medium to create in. You have to put essential information in a pleasing format but are tightly constrained by the tiny 3.5″ x 2″. If it’s done right, it’s a wonderful branding tool. The golden rule of good design: remove whatever doesn’t add to the design plays a crucial role in this format. 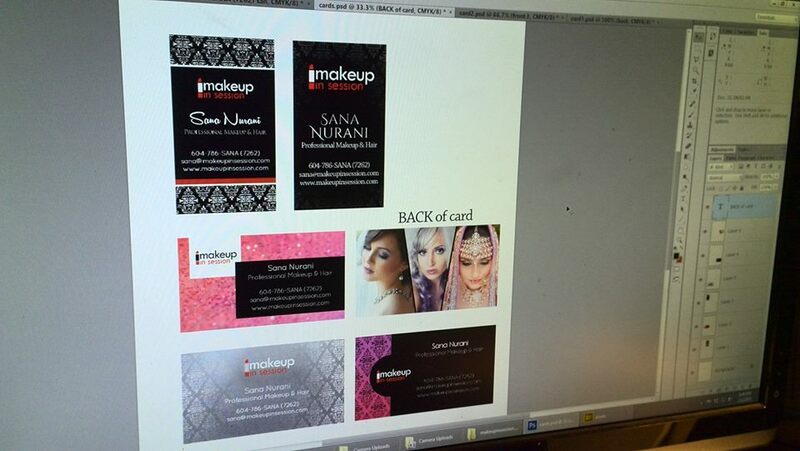 Business card design is a delicate balance of design vs information. Sometimes, design wins out but I think with business cards, information clarity and readability are more important. TIP: The MOST important trick to remember: PRINT out the design before you send the final document to press so that you can adjust the final font choice and sizes. I like JukeBoxPrint.com but there are many good print shops out there. Everyone, say hello to Sana Nurani, a Hair & Makeup Artist in Vancouver if you need makeup, hair, and beauty expertise for an upcoming event. Like her page as well, Makeup in Session. Site launching soon!